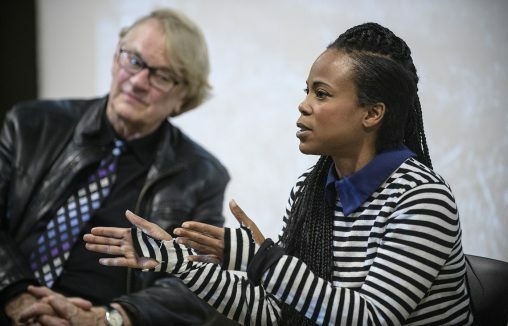 Motion pictures graduate Hannah Beachler returned to Wright State University to talk about her work as the production designer on Oscar-winner “Moonlight,” Beyonce’s hit album “Lemonade” and the new “Black Panther” movie. Beachler, who graduated from Wright State in 2005, talked about her career and answered questions during a standing-room-only discussion with performing arts students in the Creative Arts Center Dec. 4. She talked about her early career, how she learned everything she could about producing films, her creative process, working on big-budget films and smaller independent projects and the sexual harassment and assault scandals running through the entertainment industry. Beachler was the production designer on “Moonlight,” which won the Academy Award for best picture and the Golden Globe Award for best drama. She received the 2017 Art Directors Guild Award for excellence in production design and art direction for her work on “Lemonade,” Beyonce’s visual album that originally aired on HBO. She has been the production designer on “Miles Ahead,” a biographical film based on the life of jazz musician Miles Davis; “Creed,” the seventh film in the “Rocky” series; and “Fruitvale Station,” which won the Grand Jury Prize for Best Film and the Audience Award for Best Film at the Sundance Film Festival in 2013. During her visit, Beachler donated the award she received for “Lemonade” to the Wright State Motion Pictures Program in honor of her classmate Carol Trevino, of Wilberforce, who was killed in an automobile accident while working on a film near Shreveport, Louisiana, in 2007. “She was a filmmaker, a storyteller and a great writer,” Beachler said. The Art Directors Guild Award is special to Beachler because her peers awarded it to her. 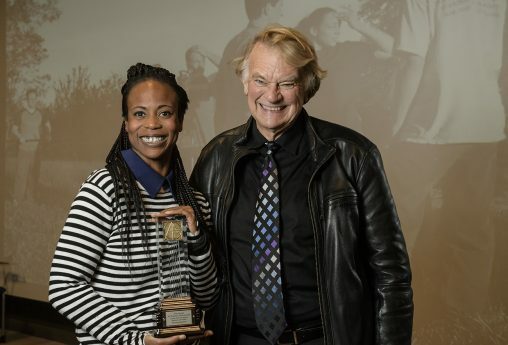 Hannah Beachler donated the Art Directors Guild Award she received for her work on Beyonce’s “Lemonade” to the Motion Pictures Program in honor of her late classmate Carol Trevino. She is pictured with W. Stuart McDowell, artistic director of the Department of Theatre, Dance and Motion Pictures. Trevino is pictured behind them working on a student film. As the production designer on Marvel’s “Black Panther,” which will be released on Feb. 16, Beachler spent 13 months working on the film, overseeing a $30 million art budget and a dedicated crew of several hundred people. She contrasted the big budget she had to work with on “Black Panther” to smaller films like “Moonlight” and “Fruitvale Station.” Her art department on “Moonlight” consisted of five people. Her previous film and video projects prepared her to work on “Moonlight,” she told the students. She discussed how she started her career as a set dresser, arranging objects on a film set. On every project she learned as much as she could, including set painting, carpentry and visual effects. She emphasized that students have to be willing to work hard and persevere through challenges. “You have to be prepared to give five, seven, 10 years of your life to get your career off the ground,” she said. Whether creating films, telling stories or designing a project, Beachler encouraged students to do things the audience does not expect. After her talk, Hannah Beachler continued to answer questions and take photos with performing arts students. After working on “Black Panther,” she took seven months off and decided to focus again on smaller films and is booked through 2019.